Vale de Pinta Golf Club is part of the Pestana group of golf course resorts (including Gramacho, Vale da Pinta, Silves & Beloura). Set on beautiful, undulating country just inland from Carvoeiro. The 8 times consecutive host of the European Seniors Tour Qualifying final, Vale de Pinta is rightly respected not just for its playability and challenging layout but for outstanding levels of beauty and enjoyment. Designed by the famous American golf course architect Ronald Fream and inaugurated in 1992 Vale de Pinta has earned its place as one of the best designed courses in Europe. The fairways are of Bermuda grass, strategically placed sand bunkers, and greens clad in Pen Cross Bent grass alongside ornamental lakes in a rolling terrain dotted with carob, fig, almond and olive trees (including one olive tree over 1200 years old!). The course is always maintained to a very high standard and the layout will challenge the best of golfers without penalising the higher handicap player. Visitors are always welcome at Pestana group courses. Now THIS is more like it.... What a great course this is!! And in contrast to the flagship course of the Pestana Group (Vila Sol) this more than lived up to expectation. This IS why I came to play golf in The Algarve. Designed by Ronald Fream, Vale da Pinta is considered one of the best layouts in Europe and you can see why. 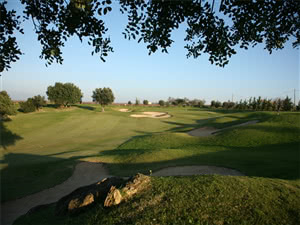 Vale da Pinta is a parkland course built into the natural contours of the terrain. After a fairly easy start the course then starts to test you with undulating fairways, plateau greens, stunning views, playing off fairways like carpets. Millionaire golf! The course has played host to the Seniors Tour in recent years and we were there the day before the regions PGA championship was taking place. There are two big lakes on the course, which invites you to challenge yourself but I would save my praise for the Par 3 -7th (165 years plateau to plateau) and the stunning approach to the Par 5 – 12th. Most greens on the course are beautifully guarded with multiple bunkers, but don’t be put off – they are full of soft, fluffy sand. There are also works under-way around some of the course but all very subtle and it does not detract from the course in any way. I can honestly say it’s one of the best courses I have had the pleasure of playing (and I have played over 120 in total to date). The clubhouse is cool and airy and the Pro shop staff welcoming and helpful. The views from the patio allow you to watch the golfers tee off and play the entire uphill first hole. However, I have one criticism…. why build a course, so that the last two holes you are playing directly into the sunset? And why put the 18th green 500m away from the clubhouse leaving a steep walk back, right at the end of your round?! This is of course nit-picking as most will visit here and take buggies and I would jump at the chance to play here again! This is a great course, with elevated tees and greens. Well worth a visit and in a perfect condition. Some interesting and spectacular holes, take a camera with you.